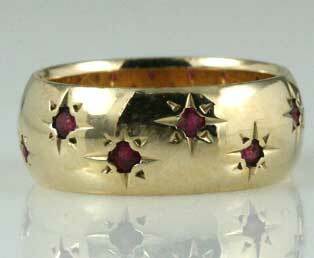 Twelve rubies are star set in this wide vintage yellow gold band ring. Bright rubies are framed by star settings and are mounted at staggered heights. These rubies are bright red and measure appx 1/2 ct tw. This 1940s polished 14kt 585 yellow band is slightly convex. Slight wear to rubies, may be enhanced.